"I have only abandoned my body. I'm still alive, somewhere in another dimension." While many anime series have a cult following, the cults seem to be strongest around the most perplexing of series. 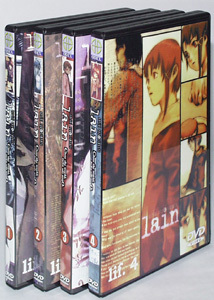 In this category fall Neon Genesis Evangelion and Serial Experiments Lain. The latter takes the weirdness with which Evangelion concludes and runs with it from the very first episode, producing a highly unique, if initially baffling, viewing experience. Junior high student Lain Iwakura (Kaori Shimizu) is a novice at computers, but when she learns that her classmates are receiving emails from a fellow student who committed suicide, she is intrigued. Sure enough, she has one of the emails herself, and this sets her off on a quest to upgrade her computer to produce an interface between the wired world and the real world. Along the way she runs into nanotech drugs, evil experiments on schoolchildren that result in madness and death, mysterious hardware manufacturers with unknown agendas, the Roswell incident and Majik-12, Men in Black with laser-pointer glasses, and underground groups of hackers, not to mention a cyber duplicate of herself. By the end, she is questioning what is the real world and the nature and existence of identity and God. This all sounds like a pretty heavy result for an anime series, and that it is. Essentially, the creators have taken the magical schoolgirl anime stereotype, which I ordinarily find saccharine and nauseating, and looked at it through a David Lynch prism to produce a dark world of nightmare where not only is nothing quite what it seems, but the reality of everything is as slippery as buttered jello. Heavily dosed with surreal events, such as characters who inexplicably vanish, there is a penetrating and ominous darkness surrounding the story, brightened only by the incredibly cute Navi computers that everyone seems to own in this "present day, present time" series. The animation is quite high quality throughout, with repeated segments only used for intentional effect instead of to save a few yen. Often the background is stark white with peculiar shadows being thrown against it, creating an unreality even to the real world. In particular, the eyes are highly expressive and are far more communicative than the dialogue, which tends to be minimalist, almost Kubrickian in its banality. Although not heavily violent for the most part, there are several highly disturbing sequences involving suicide, so I would definitely not recommend this for younger or impressionable viewers. The sound design is highly effective as well, with ominous sounds coming from all speakers, and a repeated single piano note that gives the same feeling of dread as the two-note figure used in Eyes Wide Shut. The meshing of reality and the internet, with a dominant shade of green, appears to have significantly influenced The Matrix, released a year later. However, don't come to Lain expecting action/adventure and wire fu antics, because you won't find any. If you are looking for a compelling mystery with complex clues and a solution that's not terribly obvious (it makes the puzzling final episodes of Evangelion read like a cookbook), this is a good place to start. This set of discs is from Singapore, released by Odex, but is legally licensed by Pioneer. The discs are Region 0 and in NTSC format, so no special equipment is required to play the discs in the US and Canada. The two advantages that this set has over the Region 1 version from Pioneer are 1) substantially lower price, and 2) the presence of the original kanji titles and credits for the openings and endings on all 13 episodes, which are replaced with English on the Region 1 set. The running time is nearly an hour and 3/4 shorter than advertised on the cases, but nothing seems to have been cut. Image Transfer Review: The image, like that of the Pioneer Region 1 set, is first rate. Lines are crisp and clean throughout, with vibrant colors. The same masters were no doubt used since identical rare occasions of dot crawl and jagginess are apparent on both versions. Audio Transfer Review: The only audio is 2.0 Japanese. The sound is excellent, however, with only very minor hiss and good definition. Movement onscreen is nicely paralleled by movement through the speakers. The end theme in particular has extremely low bass present. Some elements of the sound are truly startling, such as chalk tapping on a blackboard that seems to morph into gunfire. Extras Review: The extras are negligible here, beyond some promo trailers. Whereas the Pioneer set features an ample 8 chapter stops per episode, these discs provide only 2, and the second stop is only seconds from the end, with the live-action "Devices" tag material. Subtitling is sometimes ungrammatical, but the meaning can always be understood. The closing song is, irritatingly, not subtitled. The intriguing and mysterious melding of the real world and the wired world gets an attractive transfer via Singapore. Playable in Region 1, the set offers the advantage of the original OP/ED pieces, though lacks an English dub and the few extras that were present on the Pioneer set for Region 1. It will be a good and less expensive compromise for those who insist upon the original kanji credits.